Can we do the Olympics again? Oh right, we have the Canadiens, who barely squeaked by the worst team in the NHL. It’s easy to throw out the hyperbole. Newspaper columnists need to have some sort of opinion about the Vancouver Olympics in order to feed the beast, satisfy their readers and their bosses. Depending on which one you read, it was either the most friendly, welcoming and well-organized Games ever, or it was a non-stop glitch-fest that will forever be marred by the death of an athlete. CBC summarizes some reaction from around the world. Internationally, it seemed how countries thought about these Olympics had everything to do with whether the number of medals they got met expectations. For Australia, which won only three Olympic medals, it was still the best winter games ever, screamed headlines from Australian Associated Press, the Australian Olympic Committee and the Australian minister for sport. On the other hand, Russia was a disappointment at these games (a disappointment that forced the resignation of the head of the Russian Olympic Committee), and Pravda went on a rant saying simply that Vancouver is not fit to hold the Winter Olympics. On the day of the closing ceremony, criticisms read more like conspiracy theories about how organizers and officials unfairly hurt Russia to Canada’s benefit. And then, of course, there’s Great Britain, which managed only a single medal at these games. But in their defence, the criticism came long before that result. Lawrence Donegan of The Guardian was the most cited, calling it the worst Olympics ever. His words were repeated by his peers. Of course, that prompted a lot of defend-Canada pieces from Canadian media, who quoted Olympic historians, members of the IOC and VANOC attacking that view and rating these games highly. Other columnists and editorial writers took it upon themselves to defend Vancouver 2010. The truth is that the Vancouver Olympic Winter Games were somewhere in between. The people were friendly, but they could also be dicks sometimes, especially when they let their national pride get the better of them. The organizers were beset with an avalanche of problems, but reacted quickly to them. The opening and closing ceremonies were well choreographed, but … well, I won’t get into another debate about that. And as for the athletic performances, there were plenty of triumphs and disappointments (or, in the case of Lindsey Vonn, Apolo Ohno and the Canadian men’s speed-skating teams, both in the same week). There was the tragedy of Nodar Kumaritashvili, the heartbreaking disqualification of Sven Kramer in the 10,000-metre race, the childish reaction of Evgeni Plushenko after failing to win gold in men’s figure skating, and of course Joannie Rochette, who stole some of the spotlight away from an incredible performance by Kim Yu-Na. I spent most of these Olympics in front of my TV, and will remember quite a bit of them. I’ll also remember quite a bit from the 2008 Games in Beijing, and other Olympics before them. But to suggest that the Vancouver Olympics were the greatest ever (better than Lillehammer? Lake Placid?) or the worst ever (worse than Munich? Atlanta?) is probably pushing it a bit much. The next games are in Russia in 2014. And even though it’s four years away, it’s already being denounced as the worst ever. You know what, I take back all that stuff I said about the Vancouver Olympic Committee being neglectful of Canada’s other official language. Clearly they know what they’re doing. From Dave Rosen on Facebook, a video of Vancouver’s False Creek during the gold medal men’s hockey game on Sunday. The overtime goal comes at 1:20. What part of “terre de nos aïeux” don’t you understand? Remember a couple of weeks ago, just after the opening ceremony to your great Olympic Winter Games, when there were complaints from around here that there wasn’t enough space given to Canada’s other official language? I defended you back then, downplaying the seriousness of your transgression, deflecting some attention to the media, and criticizing those who criticized you. I said there should have been more French, but I wasn’t going to make a federal case out of it. After watching the closing ceremony, I’m reconsidering that. Outside of a few “bonjour”s and “merci”s, introductions and a speech by Jacques Rogge, the ceremonies seemed devoid of French. In the concert that came after, I kept waiting for some good French Canadian artists, but was disappointed when among the dozen or so English acts, all there was in French was a song by Marie-Mai (or as the Globe and Mail called her, “Marie-Maiv”*). I’m not the kind of person who will sit with a stopwatch and complain when something’s not exactly 50-50. Even 75-25, reflecting the approximate ratio of English to French speakers in Canada, would have been fine by me. But it wasn’t even that. When combined with the opening ceremonies, which included a single performance by Garou, it’s really hard not to see this as tokenism of one of Canada’s founding peoples. But unlike some of the newspaper columnists you’ll no doubt be hearing from over the next couple of days, I’m not mad. It’s not like you weren’t aware of the problem. You knew about it months ago. Both the federal and Quebec governments made sure you knew about it. You made efforts elsewhere in the organization of these Games to ensure bilingualism (which apparently took a lot of work), and I commend you for that. And even if you didn’t realize before these complaints how little attention you gave to the French language, you made plenty of changes to the closing ceremonies after the opening ones were over (including adding a very cute bit about relighting a defective column for the Olympic flame). You could have added some more French Canadian artists, maybe even a speech or two in French. Those who want to justify this slight can come up with all sorts of reasons why. It’s Vancouver’s games, not Quebec’s. These ceremonies are for the world, which for the most part speaks English as either a first or second language. Some might even argue that you just don’t care about French, that Canada should let Quebec separate and become an English-speaking country. None of those explanations work for me. The ceremony was all about Canada, not Vancouver or British Columbia. Hell, French Canadians didn’t even represent the majority of the acts you brought in from Montreal (William Shatner and Simple Plan were the others). And though the world speaks English, I’d like to think they’d want to be exposed to different cultures, even if they don’t understand the language. Some Americans appreciated Marie-Mai even if they had no idea what she was singing about. And not knowing Russian didn’t take away from enjoying the Russian national anthem as performed live. The third explanation, that you just don’t care, is something I have no rebuttal for. It’s just something I’d like not to believe. Because even though I’m an anglophone, I live in Quebec, I have friends and relatives who are part of this culture, who speak this language as their mother tongue, and who hoped that maybe, just maybe, they could spend a couple of hours believing that the Vancouver Olympics were their Olympics too, not just those of English Canada. The opening ceremony brought on doubts that this could be achieved, and the closing ceremony confirmed them. I love this country, but I love Quebec too, and Montreal. I’m a federalist, and even facing what some might think are overwhelming practical arguments against it, I believe that a Canada that has two languages makes us all better. It’s not something I have a rational reasons for, or scientific data to support, it’s just something I feel. What you’ve done has made justifying this belief more difficult. A few people on Twitter half-joked that you’d done more for the cause of Quebec sovereignty than the PQ has in decades. It’s easy to dismiss that as the close-minded ravings of a die-hard separatist, but I’m understanding where they’re coming from. You’ve made these people seem like a minor part of your country, confined to a single province out of 10. You’ve made them feel excluded from their own Olympics. And yet, all of these athletes were proud to contribute to Canada’s historic medal count, proud to drape the Canadian flag around their shoulders as they celebrated their Olympic medals, proud to look up as the Canadian flag was raised and the crowd sang their anthem in English, proud to have the word “Canada” across their chests and backs during the two memorable weeks they spent in Vancouver. Those athletes have too much class to complain about the closing ceremony. Most of the rest of us don’t care enough to make a case out of it. Even some of those in the media who calculate how many of Canada’s medals came from Quebecers will take away good memories of these Olympics. Which leaves people like Réjean Tremblay, whose words can be so easily dismissed because they’ve been heard so often before. So I’m speaking up. As a Canadian, as an anglophone, as someone who’s not a separatist or hyper-sensitive to every perceived slight against French Canada. As someone who believes that francophones, whether they’re in Quebec or elsewhere, are part of Canada too. Not just an interest group, but an equal partner in the creation of this great country. One that has as much right to speak and hear their language and live their lives in French as we do in English. I speak as someone who believes that the French language is as much a part of Canada as the beavers, Mounties, self-deprecating humour and endearing politeness that you so proudly showcased during these ceremonies. You may think this is minor, and in the grand scheme of things it probably is, but in what is supposed to be an event that brings the entire country together and serves as a shining moment of national pride, even a slight movement in another direction makes a big difference. VANOC, you disappointed many Canadians. And even if every French speaker in this country comes on this blog and says it didn’t matter, what’s important is that you disappointed me. And now that the Games are over, you’ve lost your chance to make up for it. *UPDATE: A Globe and Mail insider tells me this wasn’t actually a spelling mistake but a coding error. The “v”, which also appears after other names in the piece, is actually an internal-use checkmark used by Globe editors – ironically to verify the spelling of a name – and was improperly translated into a printable character on the CTV Olympics website. There was another one of those embarrassing media-gets-it-wrong stories today, about who was going to carry the flag into the closing ceremonies Sunday evening. The report apparently came out of Canadian Press, which reported that after meeting Saturday night, officials from the Canadian Olympic Committee had selected double-gold-medallist Charles Hamelin to be Canada’s flag-bearer. CP said it got confirmation from “two federal government sources” as well as Hamelin himself, but not from the COC. Websites that carry Canadian Press content posted the story. Other news sources, like Agence QMI, Cyberpresse, Canwest News Service and Rue Frontenac, rewrote CP’s story, some being more careful than others about its unofficial nature. The COC quickly denied the report, and later announced that in fact it would be Joannie Rochette who would carry the flag into the closing ceremony. Assuming what CP reported was true – that Hamelin was told he’d be carrying the flag, that he was getting congratulations already from fellow athletes, and that people in the government also had reliable information confirming the selection – then the erroneous report is reasonable and forgiveable. To its credit, CP left room throughout the process for the possibility that it might be wrong. I haven’t found a story yet asking the obvious question: Why did Hamelin think he would be the flag-bearer? Was he asked about it and incorrectly assumed that meant he’d been selected? Did the COC intentionally mislead him to throw the media off the trail? Did someone just assume that Hamelin would be selected because he was the double-gold-medallist? I’m hopeful that someone will be able to ask Hamelin that question, and that the various media won’t shy away from it because it draws attention to the fact that they got the story wrong. Like with the Gordon Lightfoot story, my issue isn’t so much with the media getting the story wrong as their attempts to cover it up once they’re corrected. Even as I write this, hours after the official announcement, many sources still have the wrong story, including Yahoo! News, LCN, the Vancouver Province and CTV Montreal. Other stories were simply deleted, while most were quietly replaced with the announcement. Few mentioned getting the story wrong previously, some making vague references to rumours in unnamed media. No apologies, no analysis of how they got the story wrong. And the credibility of the news media takes another hit as a result. 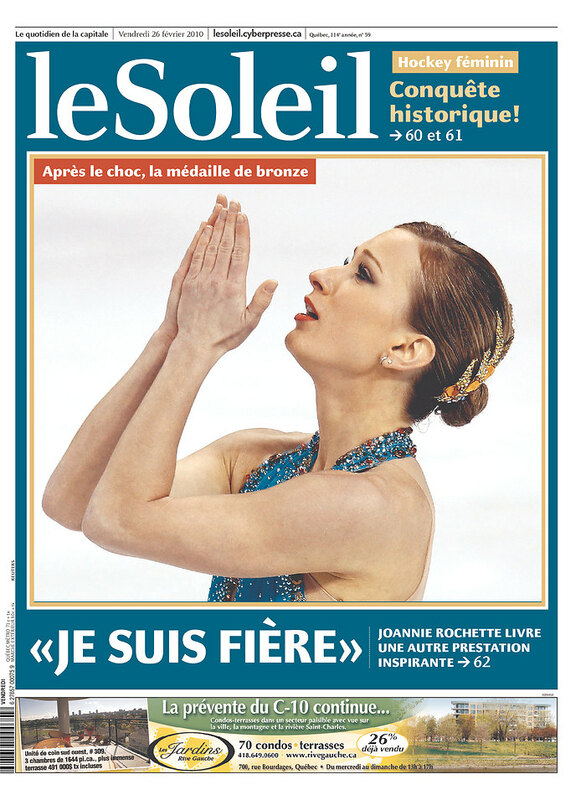 You might think there are more important things to discuss, but to Quebec media, there’s nothing more important than condemning the Vancouver Olympic Committee for having banned the French language from the opening ceremonies. Sure, they had Garou (unless you were watching on NBC – they cut to commercial when the francophone singer came on stage), and every announcement was in both languages (French first)*, and referee Michel Verrault read the officials’ oath in French, and IOC president Jacques Rogge read part of his statement in French, and Nikki Yanofsky performed the national anthem in both languages. But only one of the half-dozen songs of the ceremony were sung in French, narration by Donald Sutherland and slam poetry by Shane Koyczan weren’t translated into the langue de Molière, and VANOC chair John Furlong spoke with a thick anglo accent in the few words he spoke in French. Réjean Tremblay, Jean-Guy Fugère, Caroline Touzin, Rino Morin Rossignol, even Jean Charest and the Conservative government complained that there wasn’t enough French (though Michel David suggests the government didn’t complain enough). Jean-François Bégin wonders why Wayne Gretzky was picked over Gaetan Boucher to be the one to light the flame. Patrick Lagacé sighs that we should have expected this insult to Quebec’s position in Canada’s heritage. Touzin says most of the volunteers there don’t speak French (many of the ones who do come from Quebec). Radio-Canada has a whole dossier on the topic. The Société Saint-Jean-Baptiste expressed condemnation, according to a story that Associated Press decided was worth writing. The Globe and Mail also editorialized in favour of more French, The Gazette devoted an editorial and two columns to the subject, and Paul Wells also chimed in, proving it’s not just francophones that noticed. (Though the National Post was lukewarm in its endorsement of the outrage, and the Vancouver Sun calls it “tedious regional whining” that is “best ignored for now”.) André Pratte and Guillaume Bourgault-Côté took notice of this. Hell, even Richard Therrien complained about how commentators in France were pronouncing the city’s name in the anglo way. And Chantal Hébert complains about ignorant comments posted to news stories online (while asking for comment from her own ignorant online commentators). And Ted Bird makes a funny. So did Andy Riga. You know it’s gotten bad when even the Angry French Guy comes to the anglos’ defence. My first reaction was to think, as Francis Vachon did, that we should give them a bit of a break because this was in Vancouver, not Quebec City. But I’m not going to defend the organizers – these are Canada’s games, not those of British Columbia, and French should have been more prominent. Hopefully they’ll improve things a bit for the closing ceremonies, if only by including an extra song in Canada’s other official language. But the reaction from Quebec media – particularly Tremblay’s bitter sarcasm (he suggests it was insulting to Quebecers that First Nations were given such a large role) – is over the top. There was plenty of French at the ceremony (especially when you consider that most of it didn’t involve anyone talking at all), and the fact there wasn’t enough to satisfy some people doesn’t negate the effort made. To me, the biggest language failure came not from VANOC or the IOC, but from the television media covering the ceremony. None of the Canadian networks provided any translation for those few parts that were only in one language. RDS and V (which basically just took the RDS feed and slapped its logo on it) didn’t translate speeches and narration into French. CTV, TSN and Rogers Sportsnet didn’t return the favour for speeches in French (and when those speeches came up, the closed captioning read the very helpful “[SPEAKING FRENCH]”). This despite the fact that speech text and translation were provided on giant screens at BC Place. Meanwhile, during competitions, official on-screen graphics (provided by VANOC) are English-only, which astonishes me not only for the sake of Canadian bilingualism, but for every other country in the world that doesn’t speak English. Having English graphics on RDS and V is insulting, moreso to me than Garou singing off-key of Furlong’s pronunciation of “bienvenue”. What got to me most about this media overhyping was that suddenly Quebec seems to care about French outside of Quebec. Tremblay lamented the plight of the Acadian people, without mentioning that Quebec and its nationalist zealots are as responsible as the rest of the country for throwing them under the bus. I’ve been of the view for a long time that the battle for the survival of the French language shouldn’t be fought in Quebec – where it is already dominant – but in the rest of Canada, where it is truly endangered. But Quebec sovereignists don’t care about the rest of Canada because they know Quebec will eventually separate and there will be no reason to protect the language outside its borders. At least we can hope that this so-called controversy will help people understand that this country has a serious problem with language, and that nobody seems serious about fixing it. UPDATE: Patrick Lagacé responds to this post, saying that the battle for French outside Quebec has already been lost. Even though he says I’m “dans le champ”, I actually agree with most of what he writes. *It’s been pointed out that French is an official language of the Olympics and that official announcements are always in French. I know this. I’d like to think the announcements would be in both English and French regardless. But the fact remains that French was there. It’s not like they’re going to give the announcement in French twice (or once in French and once in Québécois joual). Something just seems not quite right here. I can’t put my finger on it. UPDATE: A correction appeared in Tuesday’s paper. Viewers of CFCF’s 6pm newscast were left scratching their heads this evening as they were presented not with their familiar anchors but with CTV News Channel’s Marcia MacMillan, who presented national news but gave a special shout-out to viewers of CTV Montreal. The local newscast began five minutes later. Turns out there was a fire alarm at CTV Montreal’s offices on Papineau Ave., forcing everyone outside at a most inconvenient time. It continued as normal after an awkward handoff. The infrequent, unplanned disruptions will give way to frequent, planned ones over the next two weeks as CFCF airs Olympic coverage for the first time in almost two decades. The noon and 11:30pm newscasts will be pre-empted throughout the Games, and the evening newscast will be reduced to half an hour, bouncing around to fit in between live Olympic events. For the most part, the newscasts will be from 5:30pm to 6pm, except for Valentine’s Day and the last day of the Olympics (which features the closing ceremony in the afternoon and early evening, pushing the newscast to 7:30). As usual, stories will be available on demand at ctvmontreal.ca, and CTV News Channel will have news throughout the Games for you heartless bastards who hate Canada. How does this compare to previous Olympic songs?